You can personally control the air-conditioning in your cabin. It is not recommended to set the temperature too low as a sudden change of temperature from outside to inside your cabin can bring on colds and respiratory illnesses. You are allowed to bring a sensible amount of personal belongings on board the ship. Dangerous items including but not limited to firearms, explosives, combustible & illegal substances may under no circumstances be brought on board. Internet is available in all public areas of the vessel as well as suites, free-of-charge for passengers who bring their own Wi-Fi capable devices. Due to the current environment and its infrastructure, the internet connection might be unstable. Although the vessel does not offer direct dial calls from cabins, in the event of an emergency, the reception desk can facilitate an international call, and associated costs will be billed to the guest’s on board account. The Strand Cruise contact information will be included in your final travel documents, and may be provided as a contact number in the event of an emergency at home. The Strand Cruise cabins, restaurants and public areas are distributed over four decks and unfortunately the ship’s layout does not allow for the installation of inter-connecting elevator facilities for wheelchair users. It is recommended passengers be relatively fit and able-bodied for land excursions. All beds can be converted into twin or double. Default is double. Guests are invited to contact us prior the cruise should they wish a different setting. The official check-in time for the Strand Cruise is 12 noon, however we are delighted to offer a couple of morning excursion options for passengers who are staying in a hotel local to their point of embarkation or arriving on an early flight prior to beginning their itinerary with us. 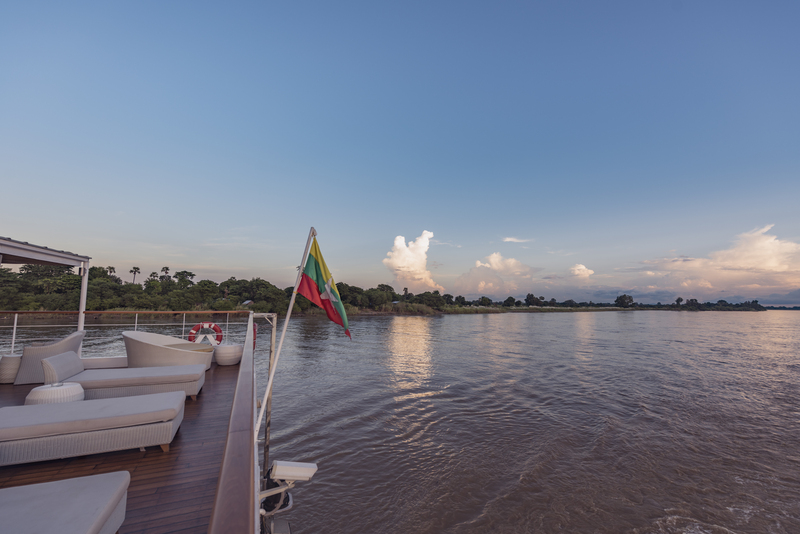 For those arriving by air on a flight landing at Bagan or Mandalay airport no later than 08:30, the Strand Cruise will arrange a greeting and pick up at the airport on arrival. For passengers already staying at a hotel locally in Bagan prior to joining the four-night Bagan-Mandalay cruise, the meeting point for the tour is at the Bagan Lacquerware House in New Bagan. Please arrive no later than 09:00. For passengers already staying at a hotel locally in Mandalay prior to joining the three-night Mandalay-Bagan cruise, the meeting point is the U-Bein bridge in Amapura. Please arrive no later than 09:15. A complimentary welcome breakfast will be served at both locations prior to the tour. Following the tour, passengers will be taken to the Strand Cruise in time for check-in. Please tag your luggage and we will arrange for it to be delivered to your cabin suite in time for your arrival onboard. The electrical current on board is 220V, two round pin type as found in Continental Europe. Burmese are generally tolerant and easy going. Please do not raise political issues with people, let them raise first. In Myanmar, disrespect for the national religion, Theravada Buddhism can cause upset. Buddhists open their temples to visitors and permit photography but you must remove shoes and socks. Do not ‘Point’ with your feet or touch people’s heads or upper body. Never cross your legs in the company of monks or elders and ladies should not sit next to monks. Do not shake hands with monks, nuns and people in general, rather smile and nod. Shorts and skirts should be at knee level or below, but it is OK to expose arms. All cabins have their own individually controlled air conditioning, en suite bathroom with shower, hairdryers, mini-safe, intercom phones, luggage storage, wardrobe, writing desk, kimono, slippers, satellite television and chairs. Cabins do not have mini bars. To avoid insects entering your cabin, it is advisable to keep suite windows and doors closed during the late afternoon and evening. It is also recommended that you apply insect repellent if you are outside your cabin or going ashore at dusk or at night. Professional laundry and pressing service is provided on board. Costs will be listed in each cabin's directory, and charged to the guest’s account. Our reception desk staff would be pleased to mail postcards upon request. Applicable postage costs will be charged to the guest’s account. The Strand Cruise will not have a doctor travelling on-board. However, if medical assistance is required, the Strand crew will be in contact with local medical authorities as soon as possible to facilitate medical services under the guidance of a doctor. Guests will be liable and responsible for all related charges. It is highly recommended for guests to subscribe to a personal travel insurance prior their journey to Myanmar. Please check with your local carrier for roaming availability and charges before travelling. Mobile coverage is usually good in main cities (Yangon, Mandalay, Bagan) however weak to none in remote sites. Daily complimentary newspapers are available. The official currency on board is the US dollar. All charges for services and products on board will be placed on the guest’s shipboard account to be settled at the end of the voyage. MasterCard, Visa and US dollars are accepted for the settlement of guest accounts. Moored or docked, The Strand Cruise will have security personnel controlling access to the ship. However, we do recommend that you lock your suite door at all times and leave the key with reception staff when leaving for land excursions. The comfort and safety of our guests is our first priority. Smoking is not permitted in the suites and public areas on board. There is a designated smoking area on the Sun Deck. The Strand spa and beauty salon offers a range of treatments from professional staff. A menu of services is available on board, and all costs associated with spa services will be charged to your account. Aboard The Strand Cruise, attire is casual and comfortable with resort-style clothing. Guests can walk barefoot if they want. Religious sites may require long pants and covered shoulders. Proper footwear is recommended for excursions. All cabins are equipped with a personal, electronic safe. The company will accept no liability for loss of any valuable items onboard. The room has to be freed at 09:00 and last check out time is 10:30. Please note that all prices on-board are excluding 5% tax and 10% service charge. All passengers are required by Myanmar customs & immigration authorities to have a passport that is valid for at least six (6) months after their scheduled departure date from Myanmar. All passengers are responsible for ensuring they have a valid visa to enter Myanmar, which can be applied for online. The Strand Cruise Ltd. shall not be responsible or liable for delay or missed portion of any cruise due to invalid travel documentation. A full safety briefing will be given by The Strand Cruise Manager following check in. We request that all our passengers attend this briefing and follow the instructions of the crew in the unlikely event of an emergency. Moored or docked, The Strand Cruise will have security personnel controlling access to the ship. However, we do recommend that you lock your cabin door at all times.